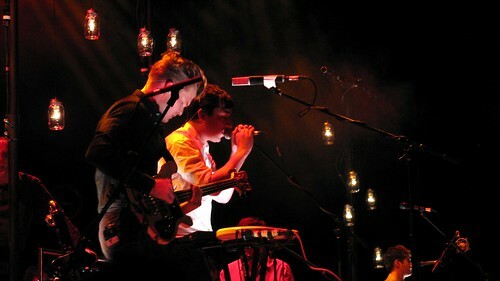 Grizzly Bear at the Roundhouse 14/3, originally uploaded by jellybeanz. This is the critical point for Grizzly Bear. Where do they go from here? Sold out two nights at the Roundhouse, critical acclaim everywhere and even an appearance on the Twilight soundtrack. There are two options, one where they follow the popular route and end up writing beautiful, if slightly dull, 3 or 4 minute pop songs. The other, which seemed so promising from earlier live performances, is to carry on with their excellent musicianship, pushing at the rhythms and arrangements while still carrying a tune. Sadly on the form of this weekend, there is a fear that they will go for the first option. On the performances over this weekend, the tracks off Veckatimest were a bit polished. Yes, the harmonies were beautiful, Chris Taylor did his usual thing of wrangling sounds from his various instruments and Christopher Bear played with control and did loud and soft at the various points. But it seemed that they were just going through the motions. Perhaps it was the fact that these shows are at the end of 15 months of touring, and the band just need a holiday. Oddly, it was the songs off the earlier albums which stood out more, possibly because while they played the same few songs off the latest album, they mixed up the set list of older songs. It was difficult to choose which of the two shows were better, Saturday night had Colorado (which is always great live) and Sunday had Shift and Fix It. It’s all summed up by an overheard comment at the end of the night ‘Ohmygod, this is one of those shows you will tell people about in the future, like Arcade Fire at the Ally Pally’. Precisely, and what happened to Arcade Fire’s music after the first album? Let’s hope Grizzly Bear have time to take a break, regroup, and keep pushing themselves. In a year or two, Beach House might end up in a similar position too. For now, they are just about carrying on doing what they do well without having to adapt for a new audience. After seeing them last year at their tiny show at the Flea Pit in East London, it was good to see them perform again, having now heard the album. 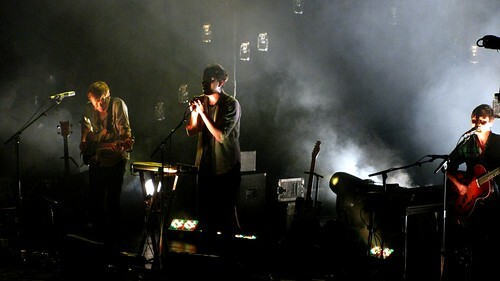 The stage shrouded by dramatic dim lights, Victoria Legrand’s voice was clearly the star of their set. It was a woozy and relaxed start to both evenings, which set the mood for the rest of the night. Grizzly Bear, originally uploaded by jellybeanz. If you look at my last.fm stats, there is one band who is easily my most played band. Unlike most bands who now rush out a new album every year, Grizzly Bear take their time to create songs that are extremely well thought out and beautifully arranged. Amazingly Veckatimest comes off even better live than on record. While sometimes the album seems to plod along, the live energy drive the songs through. 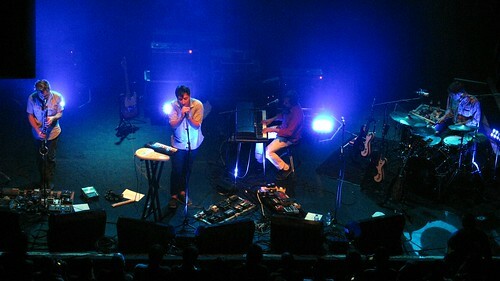 And being a band that takes risks with pushing their arrangements, they even attempted to perform the more ambitious tracks from the album, such as ‘I live with you’. 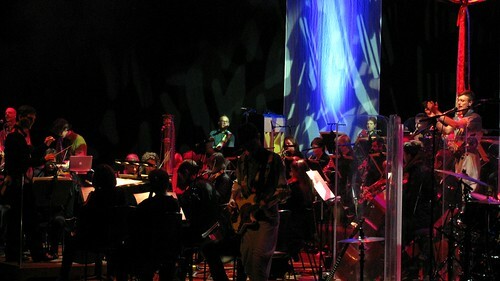 While it didn’t quite work when there was just the four band members performing, it worked as a tempting preview of what the show at the Barbican (with orchestra) may bring.